Times played: 3, with preview copy provided by WizKids! Deadline is set in 1930s New York City – in this game, your team of detectives works to solve the 12 unique cases in the box. 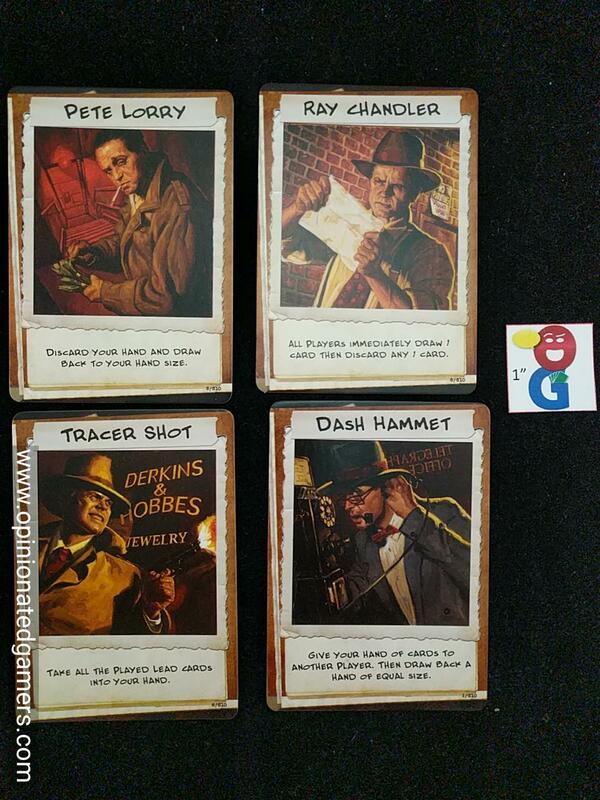 The team is made up of detectives whose names will sound sorta familiar, but you can’t exactly figure out why… Dash Hammet, Pete Lorry, Tracer Shot, Ray Chandler and four others make up your team. At the start of each case, each player chooses one of the eight detective to play for this game. Each detective comes with a unique one-time use special ability. 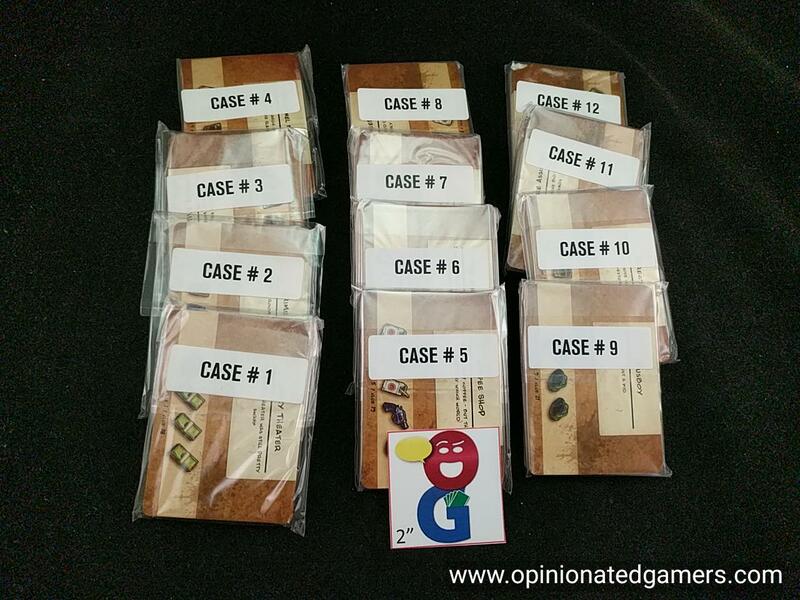 A deck of 65 cards is made for the detective’s use: 45 Lead cards and 20 Plot Twist cards. These are shuffled, and in a 4p game, each player gets dealt a hand of three cards. Each case has a separate deck of clue cards as well as a case book section that has the intro story and list of starting clues in it. 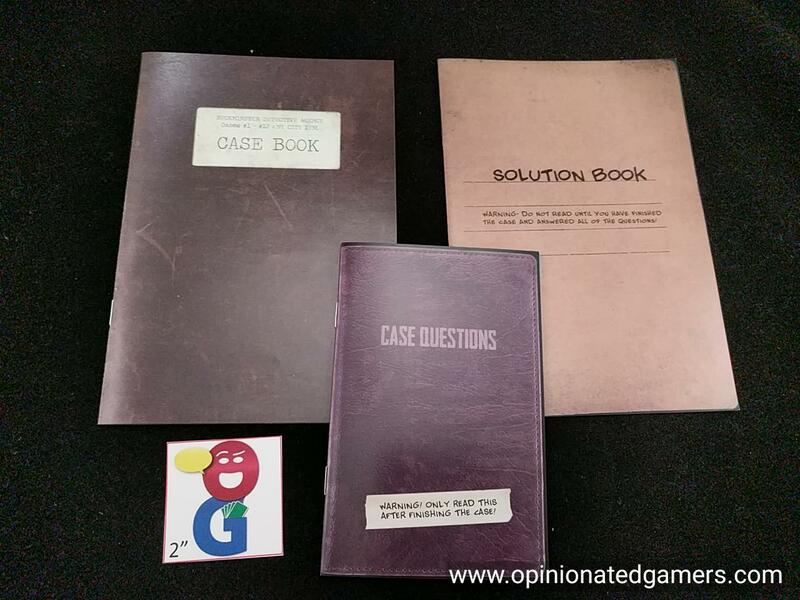 There are also separate books of case questions and solutions – you will only open this at the end of the case to read out the questions and then check your answers. Hopefully you will have discovered enough clues along the way to answer them all! So, to start a game, you first have to pick a case to play. Open up the card pack for this case – and be sure to leave the cards face down! Have someone read the introduction story in the case book – this will set the scene for the episode. It will also tell you what are the starting clues for the case. Find these clues in the deck and place them face down on the table. What you will be able to see on the backs of the cards are the location of the clue as well as a row of icons at the bottom. There are also four colored Hot Tip tokens – these are placed face up on the board. There are also three bullet tokens. They are also set aside, but you will discard one each time that your team fails to gain a Clue card in a round. A case is played in a series of rounds – until there are no more clue cards available. At that point, the players will then move into the question and answer phase. Each round follows the same format though. 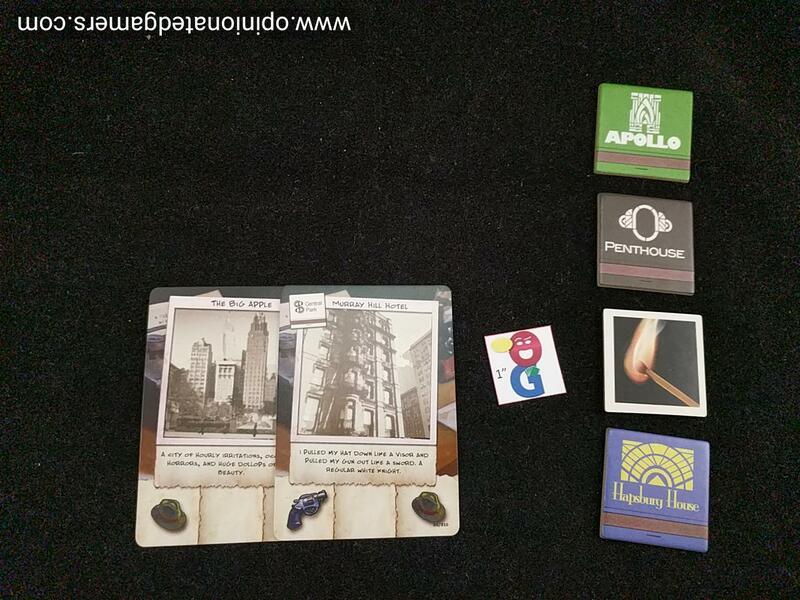 The starting player (who holds the Chief Detective badge) nominates one of the available clues – that is, one of the clues which is facedown on the table – and not still in the deck of Clue cards. 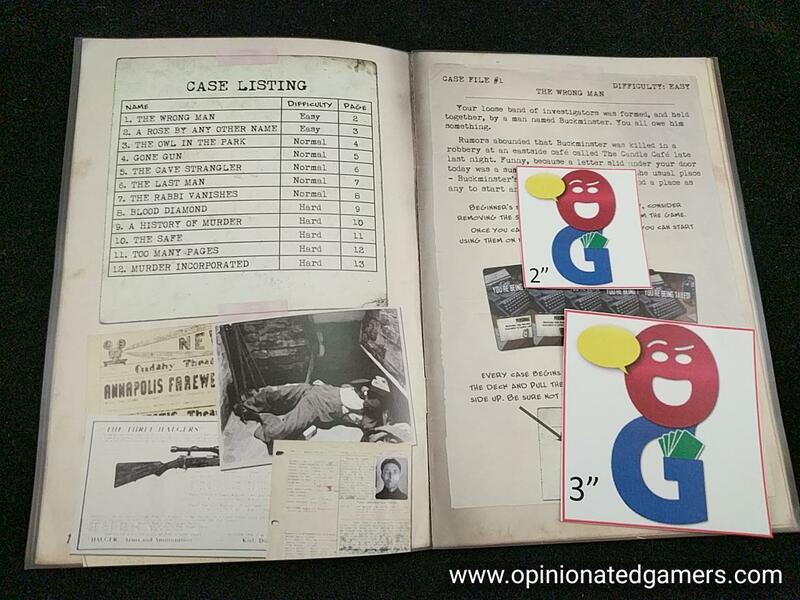 The back of the clue card has a row of icons on it – matching this line is the goal for the detectives in this particular round. 1] Play a lead card. Remember that each player started the round with a hand of 3 cards. The majority of these are Lead cards – and on the bottom – you will see a row of three icons. The first lead card played on a turn can be any card. Afterwards, each later played card must overlap at least one other card while matching the symbols underneath the overlapping portion. Note that black spaces are wild and always match whatever is above or below them. Again, the goal is to get the row of icons seen on the overlapping lead cards to have all the icons seen on the back of the Clue card. The icons in the row of Lead cards do NOT have to be in the same order – they just all have to be present in the row. If you played a card with a Hot Tip icon on it, you flip the matching colored Hot Tip token to the burning match side. You can use these burning matches in later actions. 2] Use Hot Tips – There can be up to four possible active Hot Tip tokens. You may flip over 2 burning matches to draw a new card and add it to your hand. You can flip over 3 Hot Tips to remove a Plot Twist in front of any player. You can flip over all 4 Hot Tips to remove any two Plot Twists. 3] Use Detective Ability – Each detective has a specific unique special ability that can be used once per game. You can choose to use it on your turn. Flip your detective card over so that you do not mistakenly use it a second time this game. 4] Drop Out – You must drop out if cannot perform one of the above actions. You can also choose to voluntarily drop out. When you drop out, you MUST play a Plot Twist card from your hand if you have one. It could be a Personal Plot Twist which only affects you, or it could be an Everyone Plot Twist which affects all players. However, you cannot have more than 2 active Plot Twists in front of you. If you already have 2, then you do not play another. After you drop out, you discard the rest of your hand. Play continues around the table until there is either Success or Failure on this particular clue. 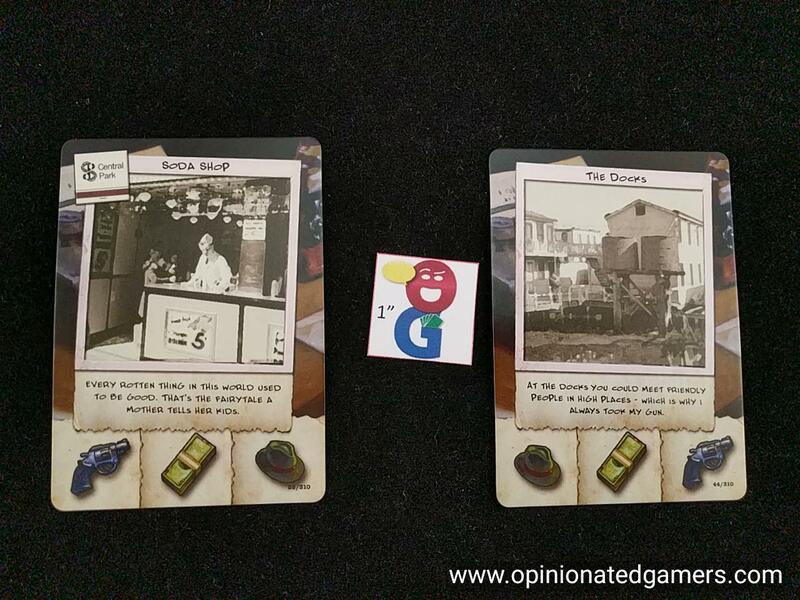 Success happens when all the icons in the row of the Clue card are seen in some order on the overlapping Lead cards. When this happens, you flip over the Clue card and read it aloud. The group will learn some important information about the case. Sometimes the Clue card will tell you to add new Clue cards to the display – go thru the deck and add the named cards to the table. The group fails if all players are forced to Drop Out without matching the row of symbols. All of the played cards are discarded AND the clue remains face-down. You haven’t learned anything new! 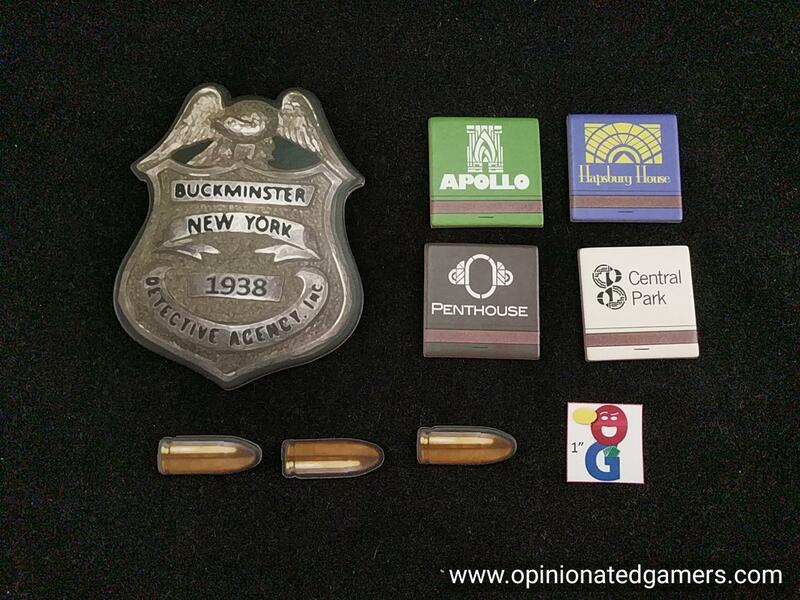 Also, you remove one of the Bullet tokens from the table (remember, that you started with 3 Bullets). If you have no Bullet Tokens left, then remove the highest numbered Clue card from the deck, and if there is nothing left in the deck, remove the highest numbered available clue card from the table. Check to see if the round ends – this happens when there are no more available clues – you will have either gained the final remaining clue OR you have failed and were forced to discard the last remaining clue. When this happens, you have hit the Deadline, and it’s time to see if you can crack the case… If there are still Clues to be discovered, all players draw up to their hand limit of 3; shuffle the discard pile to make a new deck if you run out of cards to draw. 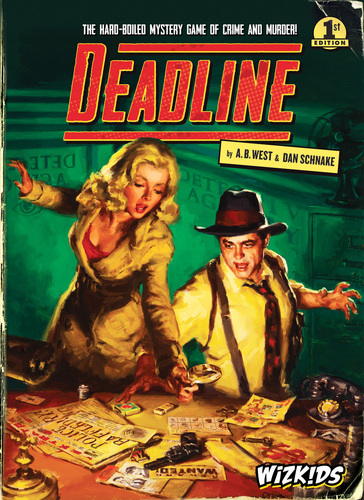 Deadline is another attempt to make a game around the deduction of solving a crime. 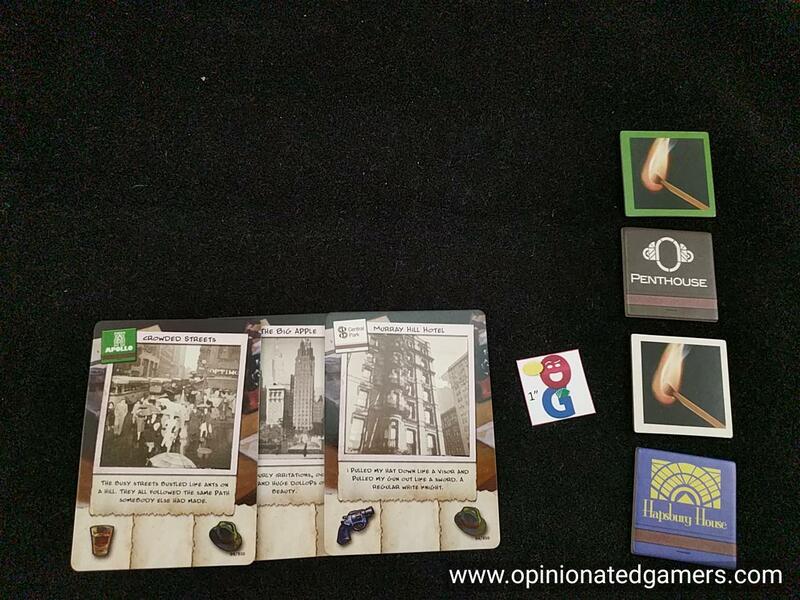 You get the very basic start of the story in the book, and then the story is laid out over the different clue cards. You generally start with 3 or 4 locations to start your investigation from, and depending on where you go, the game will lead you in different directions. There is definitely the feeling of a real investigation in Deadline as you use your previously learned facts to determine where to go next. Sure, in the end, you’ll get to the whole story no matter what as you read the cards – but I like the way that the story builds in the game. The whole process of getting the clues though is both fun and challenging. Playing the cards and matching the icons at the bottom definitely adds a gaming aspect. It’s most definitely not a guarantee to be able to get your Lead cards to line up right, and it certainly makes the game feel more cooperative. Each player has to contribute cards in order, and there is a good amount of discussion that can go on in deciding which clue card to pursue, how to play cards (usually which Hot Tip markers to play, etc) or whether to burn the Hot Tips or pass and take the consequences of the Plot Twists. Like many co-operative games, I’m not thrilled with the “you can’t say exactly what is in your hand rule”. I know why it needs to exist, but the way my brain works, I’m always questioning myself about whether I’ve said too much or whether I could/should have said more to help us along. This is definitely an issue with me – and not the game – as I have this issue with all coop games that give this strict yet vague directive. In the end, we’ve just decided to be pretty loose with what we say – because, to be honest, the whole Lead card matching thing is pretty difficult! This challenge is a lot of why I enjoy the game – the puzzle of trying to get the cards to work out is an enjoyable activity, and I like the way that it makes the results of your investigation non-guaranteed. In most other deductive games, you look at the info, choose where to go and then learn something new. Here, you have to look at the clue cards to see which you want to try to get… and then you still have the mini-game of matching icons to see whether you learn anything or not. The questions are not too bad – and in the three cases that I’ve looked at so far, the questions posed at the end of the case seemed to make sense. Unlike some of the Sherlock Holmes Consulting Detective (SHCD) cases that I’ve played, I have not yet had to make a ludicrous sideways jump in logic in order to solve a case. The info on the clue cards is divided up well. Our group usually can start debating over what we think happened by the fourth or fifth clue card, and often our theories will decide which later clues we want to go for. We have yet to answer all the questions right – due in part to the fact that we fail at getting clues a lot. Once you have failed three times (And lost all the bullets), you lose the highest numbered clue card from the deck with each later failure. And, as you would expect, there is always some vital piece of information – usually for the bonus questions – on the highest numbered card. The plot twists can be a significant roadblock – though some are more painful than others. FIguring out how to manage your hand, and how/when to play the plot twists on yourself is a big part of the game. It can be seriously punishing to discard a card with a hat each turn… when you only start with 3. You could be lucky and not get punished; but you could just as likely be left with only 2 cards to start a round – and this highly increases your chances of not having a legal card to play thus putting you at higher risk of getting another Plot Twist! Thankfully, the game has a safety valve in that you can only have 2 Plot Twists in front of you at any one time, and this helps the game from spiraling out of control. That being said, it’s super tough to get stuff done with two restrictions… Having the group work out how to get Hot Tips played to get rid of the Plot Twists is a big part of being successful. Plenty of the detective special abilities involve the Plot Twists as well, but these are generally one-time-use for the game, so you can’t rely on them all the time. 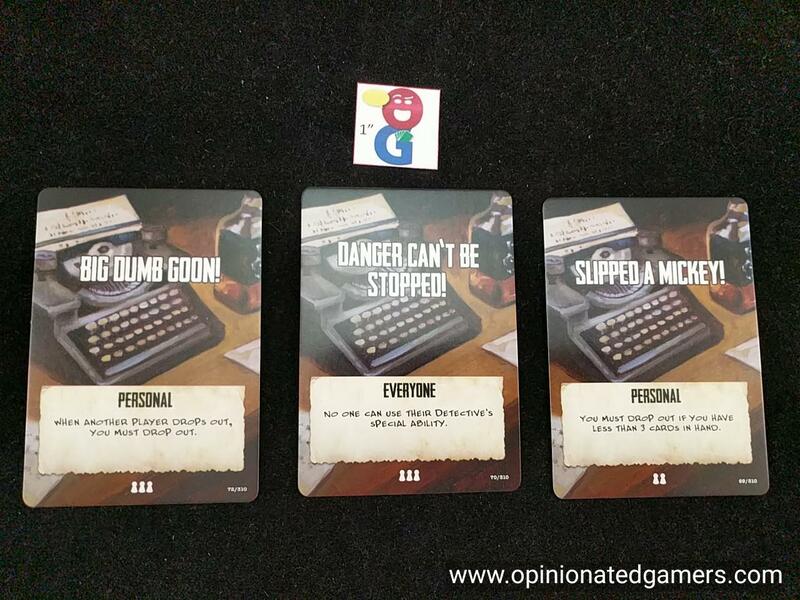 We have found that our group prefers to try to get the more complicated Clue cards as early as possible in the game – the ones which need 5 or more icons in the Lead card row. The reason for this is that we feel we have a chance to succeed when we don’t have many restrictions. Once we start getting Plot Twists played in front of us, these Clue cards become nearly impossible for us to obtain. The artwork in Deadline is fantastic. They definitely help develop the 1920s atmosphere/ambience. We have also enjoyed the little details in the game such as the flavor text on the Lead cards – it has become a must to read it out when playing a card. 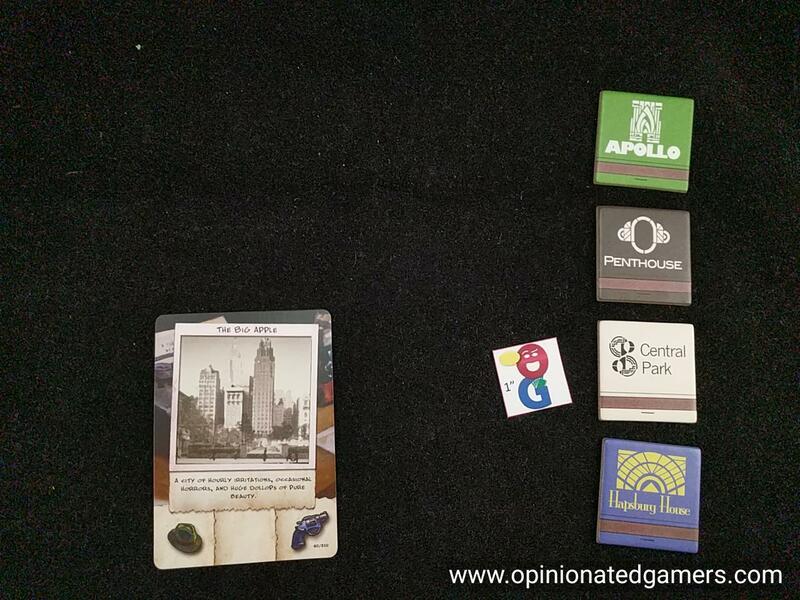 My only quibble with the components is that I wish some of the Plot Twist cards had better iconography. One type causes a player to have to discard a Lead card with a particular icon at the start of each round while a different one causes the group to need an additional icon of a particular type in order to succeed on a clue. From across the table, I can only see the icon on a card, and I wish there was a more distinct way of knowing which type of card it was. Deadline is a fresh take on the detective deduction game. Previous this year, we had played the new version of Sherlock Holmes Consulting Detective, and the original version of that game is considered by many to be the premier game in the genre. 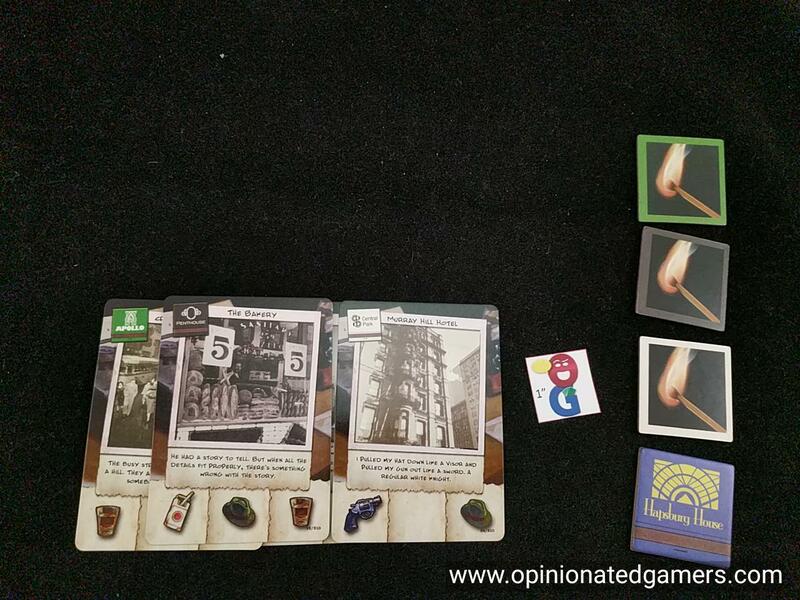 Both ask you to find the answers to questions that you only reveal at the end of the game, but the method in which you get to that point is different in each game – and there would be space for both on my game shelf because they play differently. This one feels more like a cooperative game than SHCD (which, to me, feels like a solitaire game that a group plays together). Lorna: I like the theme, but really the game plays more like a cooperative in the line of The Grizzled, rather than a deduction game. Karen M: I enjoy the game play where you are trying to uncover the clues by matching icons and figuring out which clues to pursue based on the storyline. In the first case we let the plot twists accumulate too rapidly and didn’t manage them well. In the second case, we learned our lesson and were much better at this and got all but 2 clues I think. But I lost interest in the end game where you are answering the questions. I am not particularly adept at deduction so I feel like I don’t contribute much to this aspect of the game.